The Magic Happens As You Piece and Quilt In The Hoop! Our designs are pieced in the hoop, quilted in the hoop and joined in the hoop of your embroidery machine. 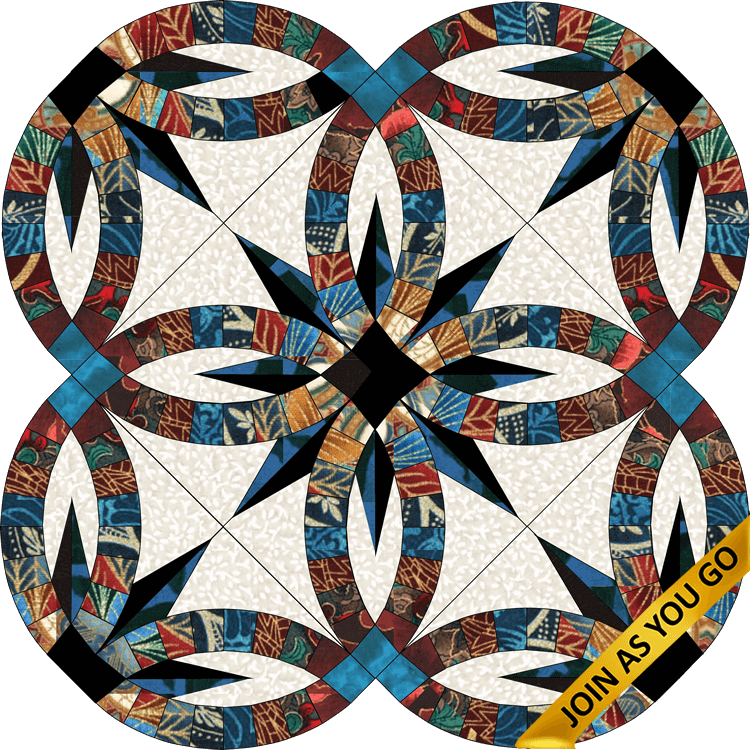 As a Quilt As You Go (QAYGO) process our blocks are joined to each other in the hoop using Jaygo (Join As You Go) our method of joining blocks using continuous batting and backing strips to eliminate the need to close the backing between blocks. Designs are guided to perfection by files sent to your embroidery machine. Learn More. Real 1/4" Seam Allowances & NO Unfinished Edges to Hide! Use our designs or plan your own quilt layout using your favorite quilting software or drawing method and then use Queen of Stitching designs to quickly create blocks that are perfectly pieced in the hoop, totally quilted in the hoop and joined in the hoop. FINALLY, Quilting Is Really Fun! Our spectacular new Wedding Star is part of the Double Wedding Ring family. 5" hoops render 10" Wedding Rings. 8" hoops render 15" Wedding rings. Includes quilt layout sizes to 135". Subscribe to learn about new releases and interesting events.